We can easily spot coasters in restaurants, bars, resorts, etc. However, how much promotion can a small coaster do for you? Many might think that a coaster is insignificant and useless. However, the right usage of Custom Promotional Coasters can positively impact your brand and advertise your beverages. They are the perfect mini advertisements that can be spread easily. On top of that, these coasters can also increase brand awareness. A well-managed Custom Promotional Coaster can also upscale your brand. Highly Customisable: There are no restrictions as to how you should design your Custom Promotional Coasters. You are able to customise the shape, colour, materials, etc. Retailers can also include crucial information such as contact details, addresses, brand logo and motto. This way, you can better showcase your brand. On top of that, you can include quotes or personalised messages to express brand personality and characteristics. It is also a great option to allow your customers to personalise the coasters as well. For example etching their name on the custom coasters. This way, consumers will have a good impression of your brand because they feel special. Such additional services allows you to be more memorable and entice consumers to return. Giveaways: Branded Coasters are not only meant to be used in stores. It can also be great corporate gifts – such as during events, seminars, trade shows, etc. Your coasters could land in the hands of your next potential customer. This mini advertisement can help increase brand recognition and brand exposure. This is extremely crucial for brands to stand out, especially in a saturated market. Being able to grasp the attention of potential buyers and be remembered will be very impactful for future business development. Practicality: Lastly, these Custom Promotional Coasters are cost-efficient as they are affordable and have the potential of increasing your customer base. Companies do not have to spend a fortune to incorporate Custom Promotional Coasters in their day to day business operations. 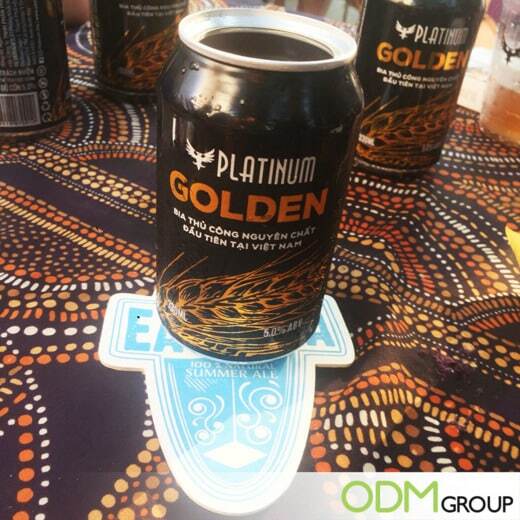 We have come across an example of a Custom Promotional Coaster by the Brand Platinum and we love it! First of all, this white and blue coaster stands out on the dark themed table top. This is because the contrast in colour brings attention to the coaster. The light-coloured coaster highlights the brand name as well as ‘100% Natural’. This information is also largely emphasised on their website, which could be their selling point to customers. 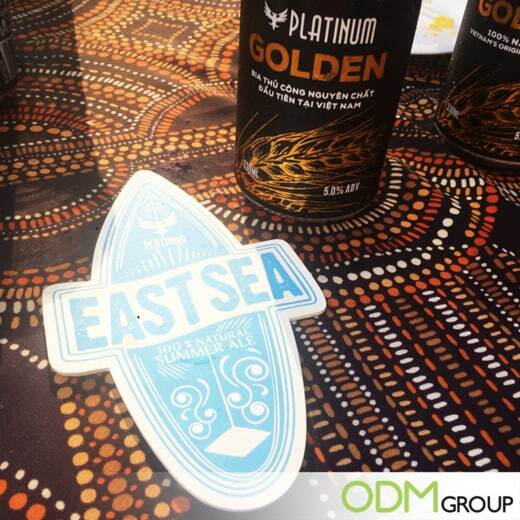 Platinum is promoting their new summer ale – ‘East Sea’. These coasters are surfboard shaped because the beer is created as a refreshment for surfers during the Saigon summer. The Platinum bottle also states ‘The first pure craft beer in Vietnam’ in Vietnamese. This also reinforces the fact that Platinum is known for their pure and natural premium beers. Consumers can infer that the beer is of quality and is worth every penny! This Promotional Coaster is successful in catching customers’ attention because of its fun and unique shape, as well as colour coordination. The simple words and branding on the coasters makes it easier for users remember. Keen on creating your very own Custom Promotional Coasters? Contact ODM today and find out how you can easily get achieve that with no hassle! Our specialist and product designers are able to provide you unique ideas to stand out. Find out how you can vastly improve your business now! Interested in more examples of Custom Promotional Coasters? Check out our other blogs! Information that is being put on custom coasters are very customisable. It is also very important what you decide to tell your consumers through a promotional product. Here is an example by Clipper Tea on the benefits of cork material coasters and its manufacturing process! How to create a successful GWP beer glass promotion? Here the top 3 marketing tricks you need to know! Below is the custom shape coasters, an excellent promotional product marketing campaign by Twinnings. Why these custom shape coasters is a great idea? How can they benefit your brand? Click below to find out more!